This Qur’aan was sent down to be pondered upon and to acquire (sound) understanding from it. And the one whom Allaah wishes good for, He gives him (or her) understanding in the religion. It is incumbent upon you [to adhere] to this Book [i.e. the Qur’aan] and the Sunnah-give importance to them (by way of) memorization and acquiring understanding; utilise them as an aid in [seeking] a sincere and pure understanding based on the Messenger’s [sallal-laahu-alayhi-wasallam] statements and the understanding of the pious predecessors [may Allaah be pleased with all of them]. However, some of the pious predecessors may have some mistakes, so we seek Allaah’s Forgiveness for them and find excuses for them, however we do not follow them [in their mistakes], for everyone can have his statement accepted or rejected, except the Messenger of Allaah [sallal-laahu-alayhi-wasallam]. Umar-and Allaah knows best-was referring to this (above) hadeeth. There is no Prophet at the time of death except that he is given a choice between the (bliss of) this life and what is with Allaah has (i.e. Allaah good pleasure and reward in the afterlife), and the Prophets chose what is with Allaah. Abu Hurairah (radiyallaahu-anhu) said: ‘The Angel of Death was sent to Moosaa (alayhis-salaam); so when he came to Moosa, he (Moosaa) struck him in his eye. He (i.e. the Angel) returned to his Lord and said: You sent me to a slave who does not want to die.’ So Allah gave him back his eye and said: ‘Return to him and tell him to put his hand on the back of an ox and for every hair that will come under it, he will be granted one year of life.’ Moosaa (alayhis-salaam) said: ‘0 Lord! What will happen after that?’ Allah replied: ‘Then death.’ Moosaa said: ‘Let it come now!’ Moosaa then requested Allah to let him die close to the Holy Land so that he would be at a distance of a stone’s throw from it.” [Bukhari and Muslim] So he (alayhis-salaam) chose death. So he (sallal-laahu-alayhi-wasallam) chose the (company) of the high companions and departed from this worldly life. This affair that Umar (radiyallaahu-anhu) referred to is in harmony with what the Messenger (sallal-laahu-alayhi-wasallam) stated about the Prophets and himself. He (sallal-laahu-alayhi-wasallam) chose that which is with Allaah (The Mighty and Majestic). He chose the afterlife over the worldly life after completing his message perfectly. Allaah perfected this religion (of Islaam) and then gave him a choice (between this world and the hereafter), so he chose that which is with Allaah (i.e. the afterlife). So this is what Umar (radiyallaahu-anhu) referred to- the Prophet’s (sallal-laahu-alayhi-wa-sallam) choice regarding that which is with Allaah (in the afterlife). 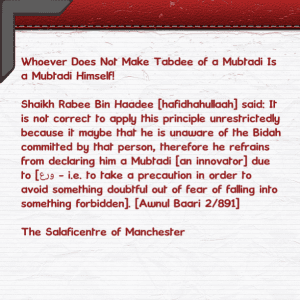 Shaikh Rabee [may Allaah preserve him] said: It is not correct to apply this principle unrestrictedly because it maybe that he is unaware of the Bidah committed by that person, therefore he refrains from declaring him a Mubtadi [an innovator] due to [ورع – i.e. 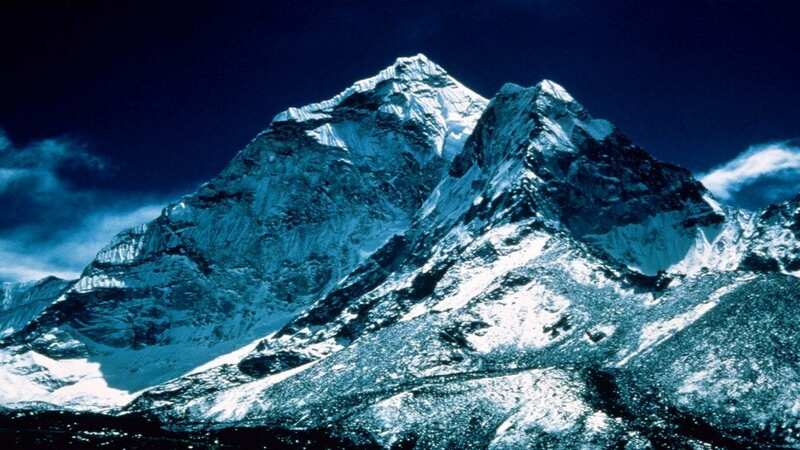 to take a precaution in order to avoid something doubtful out of fear of falling into something forbidden]. Why should you declare him an innovator? [i.e. 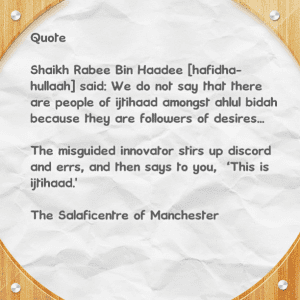 why should you declare him an innovator when it is the case that he is unaware of the bidah of that Mubtadi or refrains from making Tabdee out of ورع ]. But if he knows the innovator [i.e. knows that such a person is upon bidah due to which the evidence was established against him], loves him and allies with him, then he is a Mubtadi. This is the distinction in this affair. He knows that that person is a Mubtadi but he aids him and wages war against Ahlus Sunnah Wal Jamaa’ah, then he is a Mubtadi without a doubt. As for a person who does not know that such and such person is a Mubtadi, he is not to be declared an innovator. You [i.e. 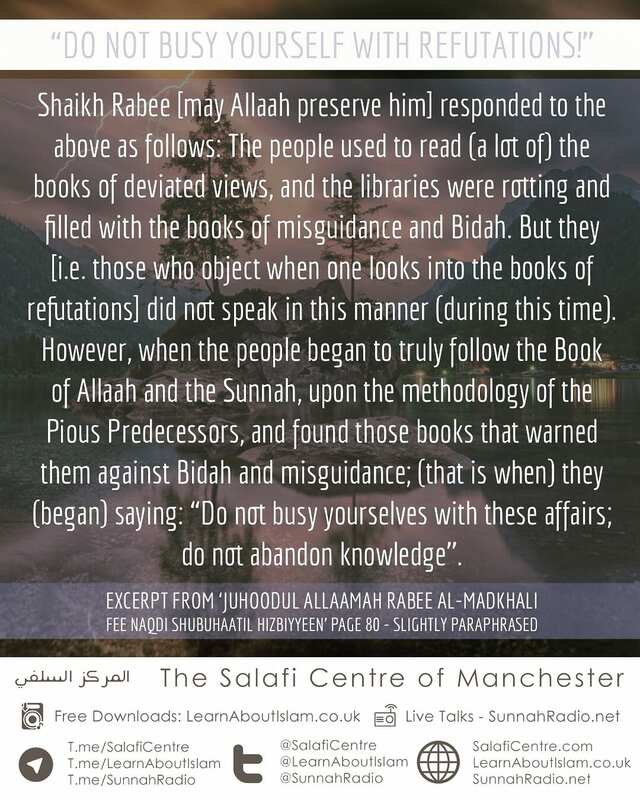 the scholar, or student of knowledge who is qualified to make Tabdee] – the one who studied the affair of [that person] and you know that he allies with a Mubtadi, places him in a favourable position, wages war against Ahlus Sunnah for the sake of that Mubtadi and for the sake of this falsehood, then this person is a Mubtadi, misguided. As for the person who does not know that indeed such and such person is a Mubtadi, then advise him and clarify for him [i.e. with clear unambiguous proofs until he understands] that such person is a Mubtadi. So, unless he ceases [i.e. refrains from defending this Mubtadi after understanding the evidences], then put him [in the same place] with his companion – the Mubtadi. The clear proof [regarding this affair] is that the worldly goals [i.e. evil pleasures, ambitions etc] comes in the way of person so he abandons the truth, speaks other than the truth, issues verdicts [or judges] based on other the truth and transmits that which is other than the truth, in order to reach [or attain] such worldly goals [or ambitions]. Then he says: ‘’I will be forgiven’’, whilst persisting upon falsehood. Then another worldly goal comes his way, so rushes towards it and says, “I will be forgiven.’’ This [type of behaviour is tantamount having] false hopes. Allaah [The Mighty and Majestic] accepts the repentance of a person when he repents after sinning, but these people do not [establish] a sincere repentance; rather they have false hopes. This is the state of affairs of those who inherited the Book and do not act upon it. They say that which is other than the truth and prefer the Dunyaa over the Aakhirah. 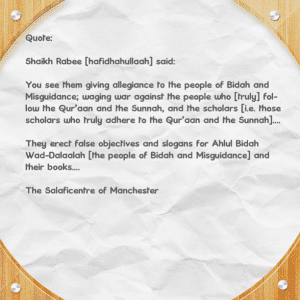 This is their state of affairs and description, and they have other characteristics that have been mentioned in the Book of Allaah and the [authentic] Sunnah of the Messenger [sallal laahu alayhi wasallam]. 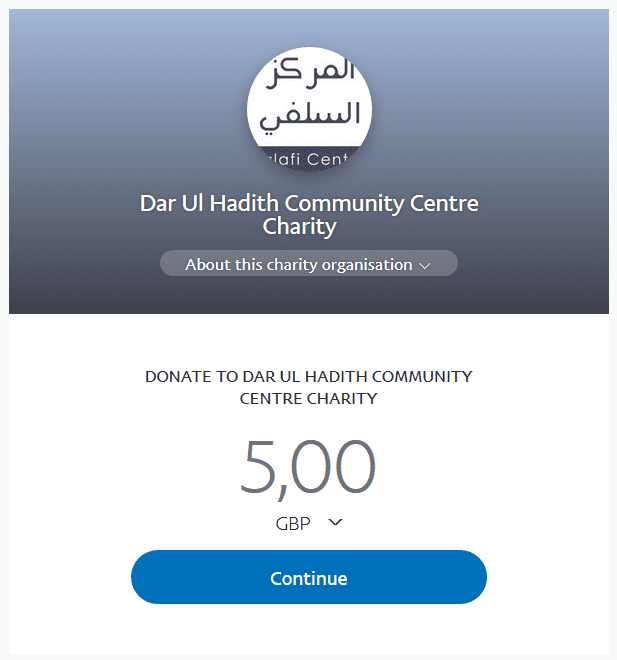 We ask Allaah to place us amongst those who know and act; keep us away from love of the Dunyaa, [evil] desires and [love of] leadership, for indeed these affairs are a cause of destruction. We ask Allaah to keep us away from these causes of destruction and indeed our Lord hears the supplication [of those who supplicate to Him].